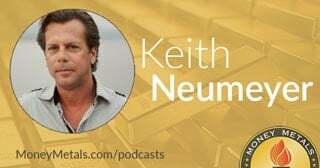 Coming up we’ll hear a fantastic interview with Keith Neumeyer, CEO of First Majestic Silver Corp. Keith gives an insider’s take on the tremendous and unsustainable imbalance that exists between the available mine supply of silver compared to gold and what it likely means for the silver to gold ratio. And you’ll definitely want to hear Keith’s long term price target for the white metal, which may surprise you. Don’t miss my conversation with Keith Neumeyer coming up after this week’s market update. So are precious metals markets about to break out or break down? We saw hints of an upside breakout earlier this week – in fact, both gold and silver pushed slightly higher to hit new closing highs for the year on Tuesday. But the move wasn’t accompanied by a huge surge in buying, and, especially after this morning’s solid employment report from the U.S. Government, prices have fallen back into the confines of trading ranges that have persisted over the past month. As of this Friday morning, gold prices come in at $1,340 per ounce, down 1.0% for the week. Silver, which was flat through Thursday’s close now shows a 2.7% weekly loss to trade at $19.84 an ounce. Gold and silver are both selling off here today thanks to the announcement of that better than expected jobs report for July. Where precious metals prices are headed this coming week or next month is really anyone’s guess. The near-term outlook will ALWAYS have more to do with the latest news events, technical levels, and momentum gauges than with fundamentals. But the long-term trend will ultimately be determined by the fundamental drivers of supply and demand. One of the greatest fundamental underpinnings for a gold and silver bull market is the fact that most all other perceived forms of money around the world are being debased. The latest central bank to make its currency less attractive is the Bank of England. This past Thursday, England’s central bank cut its benchmark interest rate for the first time in more than 7 years. Policymakers pushed the lending rate down to a miniscule 0.25%, the lowest in the 322-year history of the Bank of England. They also rolled out new bond-buying programs they hope will stimulate a weak economy and counter post-Brexit selling of British financial assets. Britain joins other countries that have entered uncharted territory in terms of monetary policy. Many of England’s EU neighbors already have negative interest rate policies in place. Britain could well follow suit before the end of the year. In an era of globalization and coordination among world central banks, the Bank of England’s decision to cut makes it all the harder for the U.S. Federal Reserve to hike. The recent GDP disappointment, as well as political considerations surrounding the upcoming election, already meant the Fed likely would do nothing until December. Now the odds are increasing that the Fed’s next move, whenever it comes, could actually be to CUT rates. Or perhaps announce a new emergency asset purchase campaign. Central banks are no longer limited to just buying government bonds. Central banks are acting like giant hedge funds now, playing with unlimited quantities of currency created out of nothing. Many have ventured into corporate debt, stocks, even real estate and tangible assets. Some are following the lead of Russia and China in expanding their gold reserves. But by and large, they are amassing ever more paper on their balance sheets. Buying up trillions of dollars in bonds and driving down interest rates to levels previously thought impossible hasn’t done much to help central banks achieve their stated goal of stimulating economic growth. They haven’t even been able to raise official inflation rates as a side effect of their unprecedented efforts. They have instead created a gigantic bubble in the global bond markets that makes all previous stock market bubbles look small by comparison. Stock investors never got crazy enough to go for stocks that sport a negative dividend yield. The insanity now gripping the bond markets is enough to drive the world’s most famous bond fund manager out of his own asset class. Bill Gross of Janus Capital said in his latest commentary that he doesn’t like bonds or stocks as investments anymore. He is shifting his focus to tangible assets including gold. It’s a radical change in thinking for someone who has built a lucrative career on financial assets. Unfortunately, most investors are still choosing their investments and making their retirement plans based on assumptions that haven’t changed with the new, low yield realities. Bonds are an asset class that has worked for 35 years. The belief that bonds are steady, safe, and gain value over time is deeply entrenched among the investing public and most financial advisors. The risk that their assumptions will turn out to be wrong, though, is very real. If at some point the bond market breaks, those who are diversified into physical precious metals will have some protection against the fallout. The time to acquire gold and silver as insurance is BEFORE the next financial crisis makes headlines, not after. Mike Gleason: It is my privilege now to bring in Keith Neumeyer, Founder and CEO of First Majestic Silver Corp (NYSE:AG), one of the top silver mining companies in the world. Keith has an extensive background on the resource and finance sectors and has also been an outspoken voice about concerns of distortions in the futures markets pricing for silver. It's a real privilege to have him back on with us again. Keith, thanks so much for joining us and welcome back. Keith Neumeyer: Thanks very much. It's exciting times, obviously, for everyone. Mike Gleason: Yeah, it certainly is. To start off here, Keith, things are significantly different today here in August compared to where they were back in early February when we talked to you last. Both gold and silver have had fantastic starts to the year. One of the things I asked you when we had you on earlier in the year was whether or not you believed we would finally get some follow through after a good first month of 2016 because that is something we did not get after good starts to the metals in 2014 and 2015. You said it felt like it was different this time around and you were fairly confident and you were dead-on correct. So what's your take on the first 7 months of the year here… what have been some of the key drivers for the advance in your view… and then how different is the environment today for someone in your position versus say 6 or 8 months ago? Keith Neumeyer: Well, you know, Mike, it's pretty interesting. This is a lot different than ... I was somewhat of that view earlier in the year when the market did what it did. The fact that we didn't have the normal correction mid-year, because, as you probably know, and it's well known in the sector, I think, that generally speaking, April, May, June are relatively soft periods for the mining stocks. And quite often gold and silver do correct into those months and then in the summer they often just bottom out and then they start to progress higher as the year progresses into November, December, and then into January and February. You could look at charts that go back 30 years and see that pattern. It's this repeated pattern that a lot of people actually trade against and have made money doing it. I've actually personally done it myself with a lot of success. This year, we saw a couple of day correction. I remember in May I was interviewed, I think it was May 18th if I recall, and the market started to turn lower after it had zero correction up until that point. I said, in the interview I said, look, let's see how long this correction lasts. It could be a couple of days, a couple of weeks, or a couple of months, and that's really going to determine how strong this bull market actually is. And that correction was only a couple of days long, then we hit new highs after that. Just recently, we've had another small correction and now we seem to have a resumption to higher prices. First Majestic hit a new multi-year high, just yesterday, which was quite exciting. It's a totally different market. I travel around the world, as you probably know, and I talk to institutional investors worldwide. What I'm hearing from a lot of investors out there is that they've misjudged this market, they have not come into this market. And a lot of money is still sitting on the sidelines waiting to come in. And I think that's why these dips and these corrections are so shallow. Mike Gleason: Yeah, they certainly have demonstrated a lot of resiliency. Like you said, the corrections have been quite shallow. Now First Majestic has had a fantastic year so far. You just eluded to that a moment ago. Your share price is up more than 400% year-to-date. Gosh, Keith, it was around 3 and a half bucks when we spoke to you in February and now it's up at $18 a share. So before I go any further, congratulations on achieving some really amazing returns for your investors. Now one of the dynamics that I'm sure has driven this exponential growth for First Majestic, and other miners as well for that matter, are the dramatic gains in silver on a percentage basis. We've gone from less than $14 a ounce when the year began to over $20 an ounce as we're talking here on August 3rd. So it's gone up over $6. And I would think that almost all of that would go straight to the bottom line. Is that fair to say? Have you done the calculations on what it means to your profitability for say every dollar silver goes up in price, Keith? Keith Neumeyer: Yeah, our costs are relatively fixed. One thing that you should be aware of is that we have been starving our mines of investment, exploration and development dollars, over the last 3 or 4 years because the focus has been to preserve cash, preserve the treasury, in order for us not to have to go to market to finance the company at ridiculously low share prices. I think we did a pretty darn good job doing that. And you're right, most of the increase in the silver price goes right to the bottom line. And at our level of production, we're producing around 20 million ounces of silver equivalent annually. For every dollar, that's $20 million extra in revenue. And we've seen a $6 increase in the silver price over the last 6 months, so those numbers are huge. The amount of dollars that are actually coming to the bottom line now, the amount of profits that we're generating are enormous because literally 90% of that money goes to the bottom line. But look, we're looking forward to reinvesting some of this capital. It's now, because of the robust cash flows or profits are coming into the business, we're looking at expanding the company again, which is going to be pretty exciting because over the last 5 years, we haven't been able to look at expansion. Mike Gleason: That leads me right into my next question. One thing we've seen here in the retail market, for silver especially, is that now that we're over $20 an ounce in silver, we're seeing retail demand decline, which tells us that maybe the last 4 or 5 tough years for metals investors have spooked the small group of folks, relatively speaking, who've already invested silver and maybe many of these folks may not believe this rally has legs. First off, how confident are you that higher prices are still ahead in the next year or two? And then has that improved environment resulted in more aggressive exploration by you and/or others? It sounds like maybe it has. Keith Neumeyer: It's a slow process. Look, I’m a bull on the metals. This bull market has resumed. We're going to see much, much higher silver and gold prices over the next 1 year, 2 years, 3 years, 5 years. No one knows how long the bull market is going to last again. We had a 10-year bull market that went from 2002 to 2011, 2012. We turned into a very deep bear market that last almost 5 years. Who knows where we're going to be going, but I'm pretty confident that we're going to see new highs in both gold and silver. I look a couple of things, and this is how I determine that. If you go back and look at where the last bull market started, you look at 2002, we had $5 silver prices and we had $250 or $300 gold. Gold went to $1,900, which is basically is almost 7 times. And we went to $50 on silver, which is almost 10 times. If you use $13.50 as the low on silver, that's $135 silver if the same ratio was to repeat itself. And that's multi-thousand dollar gold prices. And that's why I'm expecting to see. It's hard to imagine those kinds of prices when we're at where we are today, and it may even seem silly or somewhat ridiculous to talk about prices at those levels, but I'm pretty confident that looking back, 3, 4, years from now, looking back at this time, we're going to be shaking our heads, probably wishing we would have been a little bit more aggressive. That's why I put together my new company, First Mining Finance. We bought 8 companies over a 13-month period from April of 2015 to early this year, March, April of 2016. I did that on purpose. I did that because the valuations were so low and my expectations of what's going to happen to the metal prices in the coming years. Mike Gleason: Now Keith, we know you're not a big fan of the futures markets being the primary mechanism for price discovery in the metals. You've been quite outspoken about the shenanigans that have gone on there. Certainly, there is something broken about a system where a handful of bullion banks can sell a bunch of ounces on paper representing a very finite resource like silver and creating those contracts in virtually unlimited quantities. It's the producers who suffer the most if prices are held artificially low. So far this year, however, renewed speculative interest in the metals is driving prices higher. Now what's interesting is that there is an extraordinary surge in the quantity of metal actually being delivered on COMEX contracts, especially in gold. It makes us wonder if these developments are making the short sellers nervous about selling much more paper silver. What are your thoughts on the recent action in the futures markets? Keith Neumeyer: It's pretty interesting. We're reaching extremes that we've not seen historically. Usually the commercials are right. If you go back at least 15 years, since I've been really following it, the commercials are the ones that seem to make all the money. There was a saying, "just follow the commercials and you'll do okay." This time around, are they wrong? I don't have an answer to that question, but it's sure looking like a desperate situation. With the metals not wanting to correct, I think it's pretty exciting for investors. There's definitely the potential there that we can see, finally, the market squeeze out some of these manipulators, some of these short sellers, who've been screwing around in this market for decades and making fortunes on the back of retail investors as a result. Mike Gleason: Since we spoke last, the Shanghai Gold Exchange announced a fix for gold as an alternative for the London fix. A silver fix may be coming and many hope price discovery will be improved there, which is to say more closely related to supply and demand of the physical market. It isn't clear to us what to expect. Can you give us your thoughts about the Shanghai Gold Exchange? Keith Neumeyer: Well, quite honestly, I think that's why we're not seeing the big spike down that we're so used to seeing. I remember, well everyone remembers, going back over the last 10 plus years where we would wake up one day and low and beyond gold is down 50 bucks in one day and silver is down a buck in one day. And it's always on one of these very illiquid days or right at the end of the month when they need print a certain price so that their books look good for quarter-end or month-end or whatever they're trying to achieve. It's just the shenanigans that everyone got used to. You roll your eyes when it happens (you say) “oh geez, they're doing it all over again?” And the regulators are just sitting back and watching and doing nothing about it. And the retail investor just has to accept all the nonsense that goes on without anyone coming to the rescue as they should be. And now we've got a new player in the marketplace. And I think as we do see more and more players enter this market, and the silver fix obviously comes in, it's going to be more difficult for the same kind of games to be played. And I think it's very exciting. And I'm hopeful that we're going to see, finally, proper price discovery as a result of the new players coming into the market. Mike Gleason: Last year you announced that First Majestic would hold back some of its production because prices were so cheap. You urged others in the mining community to do the same, although I remember you saying you didn't have much success at all in recruiting others to do likewise. So have you now sold some of that 2015 production at these higher prices, now that prices have risen above $20? Are you still holding back production or are you now willing to sell all the silver you produce as well as those reserves you built up? Basically, how has that move to hold back some of what you produced last year worked out for you, Keith? Keith Neumeyer: We did it a few times, 3 times, I believe, to be exact. And we're now out of those positions. We have taken advantage of the higher metal prices. It's helped the company dramatically. Our treasury today is somewhere around 110 million U.S. dollars. It's the highest it's been in 5 years. So we're very excited about the amount of capital that we have in our treasury. And that's going to allow us to start investing in the business and start building the business. I think, ultimately, that's really what investors want us to do. We've got a couple of mines that can be expanded. We've got a couple of development projects that should be operating mines and will be operating mines over the next 3 to 5 years. That's where our focus will be and I think it's going to be welcomed among our shareholders. Mike Gleason: Yeah, I have to think that some of your cohorts there who didn't go along with you are probably wishing maybe they had. Keith, you spoke to a reporter from Bloomberg about a major Japanese electronics manufacturer who approached First Majestic about the possibility of buying silver direct, which implies they're concerned about silver availability. Why do you feel this is significant and have you heard about more of these kinds of inquiries? Also, more generally, are you seeing any other signs that refiners and manufacturers are worried about finding an adequate supply of the raw metal? Keith Neumeyer: Well, you know, that was an interesting situation. First Majestic I founded 14 years ago and I've said a number of times that this is the first time ever that we were approached by an electronics manufacturer for a silver supply. So I think that's quite significant. Nothing has happened yet. We're haven't entered into any agreements, nor do I know whether we're going to do it. There's still the possibility that it could happen. But the approach did occur and I think that means something. These users of the metal I don't think would be going directly to the source if there was not problems within the supply chain, or at least perceived problems or potentially a perception of future problems. I'm not in their board room so I can't tell you exactly what their rationale is, I can only speculate. But talking to some on the gold side, I know that the refineries in Switzerland, for example, where a lot of the gold goes through, that goes into Asia, are clamoring for gold. There is definitely a tightness in the silver space which I'm very familiar with, obviously, but there also is a tightness in the gold space as well. Mike Gleason: We saw industrial users for a certain precious metal, palladium, hoard large amounts of it, gosh, I think it was around the turn of the century here when there was possible shortages in that metal. Electronics manufacturers, for instance, they're using a very small amount of silver in their products. The price of silver really doesn't affect them at all, but they're going to be darned if they're not going to be able to get it. Shortages beget shortages, as the saying goes, so that would be very interesting to watch play out because these industrial users are not going to be putting themselves in a position where they can't be getting silver. So it certainly is interesting that you were approached by those folks. Is that one dynamic you think we could see, just based on the amount of silver that's out there and the amount of people that want it? Keith Neumeyer: I'll throw in a couple of stats. One that I look at is the ratio of mining and the ratio where we're trading. We're mining on a global scale right now, silver to gold, 9 to 1. So for every 9 ounces of silver, we're mining 1 ounce of gold. We're currently trading in the low 60 ratio. So how do you trade at 60 to 1 or 65 to 1 when you're mining 9 to 1? That makes no sense to me. We've been in a deficit for multi decades now. The above ground supply of the metal is very, very low. It's actually at historic lows. Another interesting dynamic that I point to is the lack of silver companies. When I put First Majestic together, there was actually a handful of true silver companies. And I look at a company that calls themselves a silver company as a company that has more than 50% of their revenues from the sale of silver, then, legitimately, I think they can call themselves a silver company. Well there's only one company in the world, major company in the world, that has 50% of their revenues from silver and it's First Majestic. We have about 70% of our revenues from the sale of silver, the rest being a little bit of gold and a little bit of lead and a little bit of zinc. It's impossible to be 100% because every mine's got some other metal, but to be that pure is actually extremely rare. The question I have is why in the space, and there's about 12 or 14 companies that call themselves silver companies, why do these companies have less than 50% of revenue from the sale of silver? You can talk to many of the CEOs of these companies, I'm not going to name names, but they're going to tell you that the reason why they ended up becoming gold companies is because they could not find good silver mines. First Majestic, over its 14 year history, has been able to accumulate one of the most interesting portfolios of silver assets in the world and has become the second largest silver producer in Mexico as a result of this portfolio. And our focus is to remain as pure as possible so when investors want to buy a silver company, they can come to First Majestic. Unfortunately, they get sucked into some other companies that call themselves silver companies that simply are not silver companies, but that tells me that these silver mines are way rarer, silver is way rarer, than people actually think it is. So I think we're going to see huge ratio collapse. I'm looking for a ratio closer to 9 to 1 where the actual mining ratio is because that's where the financial number, that's where silver prices should be. It should be 9 to 1. Mike Gleason: Certainly. We saw the ratio I guess down to about 32 to 1 in 2011. The classic ratio they say is in the teens, 15, 16 to 1, but yeah, we may see it as low as 9 or 10 to 1. That would be very bullish for silver's future. Well Keith, as we begin to close here, I want to get your thoughts on what you expect as we move further into the second half of the year here. There's a lot of uncertainty in the world, a big election coming up this November that has a lot of people watching and perhaps concerned and nervous about the future and what's going to happen. How do you see the metals performing in that environment? Will we see follow through from the wonderful first half that we've had here in 2016? Keith Neumeyer: Well definitely there is going to be follow through. We're going to go all the way into September, October, November here, which are generally pretty strong months for the precious metal and mining stocks. And I don't see any reason why that's going to be any different. We're going to go into the elections. We're seeing Europe fall apart in front of our eyes and we're seeing the political environment around the world become more destabilized. Quite honestly, the world is probably the least safe that it's been probably in the last 2 or 3 decades, which is very unfortunate. And I think all that is going to contribute to higher gold and silver prices. But predicting where we're going to go is a little bit of a fool’s game. And quite frankly, I've been wrong. I would have never predicted silver would have gone from $50 an ounce to $13.50, nor gold go from $1,900 to $1,050. I wish I had predicted that… we would have done a few things differently. But we're now back into a bull market. A few months ago I predicted, that silver would hit $20 by the end of the year and that's me being conservative because we've been beaten up so badly over the last 4 or 5 years, and sometimes being conservative is sometimes a better approach. But now I'm a little bit more comfortable, obviously. We're obviously at $20 silver. We're at $1,350 gold, currently. I think, quite honestly, there's a chance that we're going to see $25 silver by the end of the year and then we could likely see $1,500 or $1,600 gold by the end of the year. Maybe those will prove to be too optimistic, but if it doesn't happen between now and the end of the year, it's going to happen sometime within the next 12 months. So I'll be patient and continually build both First Mining Finance and First Majestic as the market allows us to continue to build these businesses. Mike Gleason: Well, Keith, I can't thank you enough for sharing your insights and your firsthand accounts of what's going on in the silver mining industry. We really appreciate your time and wish you continued success. Now before we let you go, please tell our listeners how they can get more information on First Majestic and also, since we didn't talk too much about it, First Mining Finance (OTC:FFMGF) (CDNX:FF.V), because I know you continue to see a lot of interest from investors wanting to get involved with that new venture. Keith Neumeyer: Both the websites obviously. First Majestic Silver is just simply www.FirstMajestic.com. First Mining Finance is www.FirstMiningFinance.com. You can follow me on Twitter, Keith_Neumeyer. I don't do a lot of tweeting, but at least if you follow me, you'll get all of First Mining's news releases and First Majestic's news releases and the industry-type bulletin that goes out that some of your listeners may be interested in. Those would be the best places to go. Or you can even phone either of the companies, investor relations fellows there, Todd Anthony and Derek Iwanaka, would be happy to talk to anyone that calls in. Mike Gleason: Well thanks again Keith. We sincerely appreciate it. We would love to catch up with you again down the road. And I hope you have a great weekend and take care. Keith Neumeyer: Yeah. Thanks very much for your time, Mike. Mike Gleason: That will do it for this week. Thanks again to Keith Neumeyer, Founder and CEO of First Majestic Silver Corp, ticker symbol AG. And don't forget to check back here next Friday for next Weekly Market Wrap Podcast. Until then, this has been Mike Gleason with Money Metals Exchange. Thanks for listening and have a great weekend everybody.